You’ve probably seen the viral social media posts of faculty writing inspirational quotes on bathroom stalls, teachers having secret handshakes with students, or principals joining the dance team for the talent show, but what does it really take to create positive culture like this in schools? Also known as climate, the culture of a school is imperative to its success. The culture of a school is arguably even more important than the academic curriculum, as when students have a positive feeling toward their school, they tend to achieve better. This can be explained simply by examining Maslow’s hierarchy of needs. Maslow’s theory proposes that we need certain essential needs to be met before we can go on to achieve more. Before anything else, physiological needs, such as food, water, warmth, and rest need to be met. After that, safety needs must be met. Next, people need to meet psychological needs, such as belonging and self esteem. Once all of these are fulfilled, then we can reach our full potential. 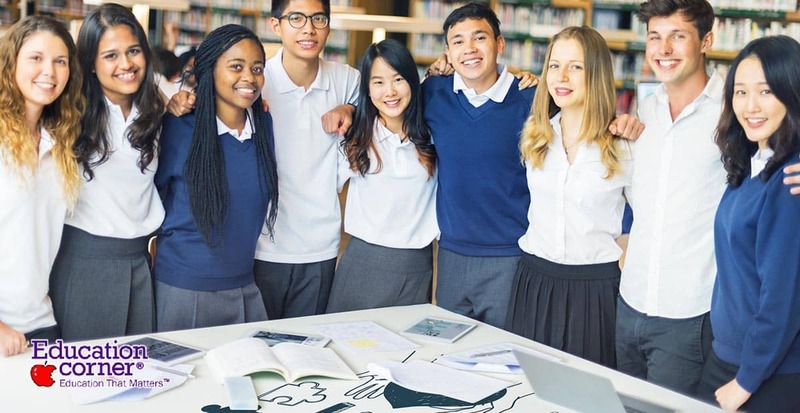 By creating a community culture in schools, these prerequisite needs can be met to allow students to achieve their full potential in both academics and extracurriculars. How exactly though can schools make this happen? A culture of community doesn’t just happen. It takes careful planning and daily practice to effect change and maintain positive school climate. According to Joe Sanfelippo and his hacking leadership philosophy, the culture of a school comes directly from the leader, and it makes sense. If the leader of a school doesn’t care enough to devote time and money to students, why should anyone else? Even if they don’t like to admit it, students follow the example of leaders, so it’s the responsibility of principals, teachers, and parents to set the tone for the students. To be most effective, this influence needs to come from the top down with principals and other administrators setting the tone for the importance of community and culture. They also need to be receptive to new ideas brought forth by school community members. Just as important as verbally setting the tone, though, is leading by example. Principals and teachers need to actually walk the walk to encourage parents and students to participate in the school community. Kent D. Peterson and Terrence E. Deal outlined 3 key things leaders should do to create culture: read the culture, uncover and articulate core values, and fashion a positive context. When new leaders step into a position, it is easy for them to fail when they don’t first read the culture; you can’t make a complete 180 overnight and if you try, you’ll likely face resistance. Once a leader understands the values already in place, then they can work to improve upon them and the culture. Peterson and Deal suggest engaging in some of the following activities: celebrating accomplishments of staff, students, and community; recognizing efforts; observing and engaging in rituals and traditions; and keeping the focus on students. In their book How to Create a Culture of Achievement in Your School and Classroom, Douglas Fisher, Nancy Frey, and Ian Pumpian explain that the culture of a school is so important that it should actually be an second implicit curriculum. Although implicit, this culture shouldn’t be a secret, rather it should be part of an ongoing dialogue between administration, teachers, parents, and students. According to Fisher et al., the culture can successfully develop with a combination of “actions, traditions, symbols, ceremonies, and rituals that are closely aligned with [the] vision” of the school. Typical school leaders aren’t the only people who can contribute to the community of the school, however- parents play a huge part as well. Simply by being present in the school, parents send the message to students that education is important. Superintendent of Surrey School District in British Columbia, Jordan Tinney, recounted an example of a time he saw parents completely transform the culture of a school. The hallways were beautifully decorated with flowers and lanterns for Chinese New Year and when he inquired about the beautiful and welcoming decorations, he found that they weren’t created by students or teachers, but by parents. You can’t underestimate the impact of a welcoming environment and collaboration from all angles. Administrators are busy managing the day to day workings of the school; teachers are busy planning lessons, teaching lessons, and grading work; and students are busy juggling school, work, play, sports, dance class, etc. Sometimes it is the parent who steps in and makes all the difference to help everyone in the school take a break and come together. Parents who want to be involved but aren’t sure how will find that there is plenty to be done if they simply ask. This doesn't just have to come in the form of the PTA or a class parent; even at the high school level, teachers, clubs, honor societies, and sports can benefit from parent involvement. Another important aspect of community culture is teacher communication and collaboration. Students notice when their teachers aren’t on the same page. Classes and teachers need to work together to make the school community come together. School culture is lacking when each individual class does its own thing as disjointed parts. Cross-curricular activities among classes and simple knowledge of what is going on from one class to the next helps to bring everything together. PIa-Maria Niemi found in her study “Creating A Sense of Membership in Basic Education: The contributions of Schoolwide Events” that school wide events both promote and reflect the culture and community of the school. The atmosphere and connectedness of these events help students feel as though they belong. It goes without saying that when students are excited about events at school and feel like they belong, they will be more likely to come to school and contribute to the culture on a daily basis. Niemi also notes that students should have a say in how the community is formed and what events take place. Doing so gives them ownership and makes them more likely to buy in to the activities. Then when these activities take place, students feel like they belong. Another important aspect of the community culture is that “togetherness” doesn’t just have to come from whole school activities. School leaders can make students feel like they belong via smaller groups and activities as well. There should be a club, niche, or “spot” for every student, whether it be the National Honor Society, art club, or debate team. If there isn’t a spot for a student to fit in, they should be encouraged and supported to create one. Students can be recognized on announcements, on a bulletin board, by calling home to parents, by being given a small prize, etc. A lot of these ideas are simple and often quick and easy to plan, but they are invaluable in bringing everybody together. And again, making these things happen comes back to leadership. It’s not difficult but somebody needs to step up, and that person needs to be supported and backed by the administration. Whether they realize it or not, leaders truly set the tone for the organizations they represent. If a community member thinks their idea will be immediately shot down, they’re not even going to try. Creating a community culture takes just that, a community. From administrators to teachers to students to parents, no one group can do it alone. Administrators needs to set the tone for and define the community culture. They also need to support efforts by all members to facilitate culture building activities. Teachers need to communicate with one another in collaboration; they also play a big role in planning culture building activities. Students should have a say in what their school culture looks like to encourage participation and foster belonging. Parents also play a vital role, often stepping in to fill in the gaps and help students recognize the importance of the culture and their education. By working together and communicating, all of the moving pieces of a school can work together to create a positive community culture.